When author and restaurant owner Amanda Battley (pictured) was just 13-years-old, she made a decision that would set the course of her life. While other kids her age were hanging out at the fish and chip shop after school, Amanda had made the conscious choice to eat healthily and nurture her body. That was at a time when healthy food wasn’t on many menus, so her mum put her strange new desire down to being a fussy eater. But to Amanda it was more, so she began researching the correlation between health, mind and body. She started practicing yoga when she was 20 – the days when yoga was for hippies and alfalfa sprouts were fed to the birds. 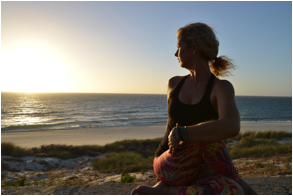 However, yoga became an integral part of her life culminating in a two-year, 350 hour Yoga Teacher Training Course in Vinyasa taught by Tamara. It was a life changing experience. Concurrently she studied Buddhism and travelled through India practicing yoga and partaking in meditation classes in places such as Rishikesh, on the Ganges that is known as the yoga capital of the world. Through her research she also became aware of Ayurvedic foods and the positive difference it made to how she felt and looked after including these foods in her diet, and it made her a life-long convert. 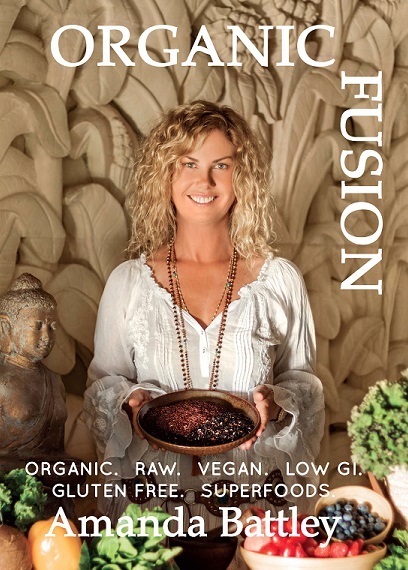 She is currently completing a raw food course in London and her love of healthy, natural and organic foods and her affinity and natural flair and love of cooking and creating nutritious and tasty meals, plus her love of Bali, led her to open her organic food restaurant, ‘Buddha Soul Organic Fusion’, at Padang Padang Beach, Uluwatu Bali in 2010. That cook book, ‘Organic Fusion’, was launched last December and was an instant success – it included the most popular items from the Buddha Soul menu, plus overall advice on living a healthy/balanced life. 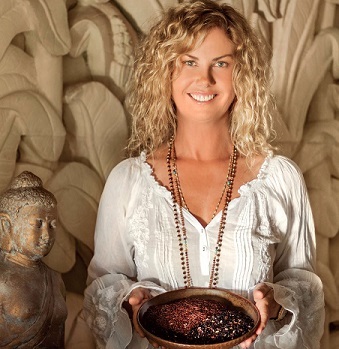 In June Amanda will open her second restaurant also in Padang Padang Beach, Uluwatu, Bali. ‘Omburger’ is a superfood burger restaurant, focusing on using organic where possible and of course, super foods. There are a lot of vegan options with the burgers and they don’t use any white chips in the restaurant. There are also bun less options, using field mushrooms and eggplant or zucchini in place of the buns. However, if you are partial to a bun, you can choose from green tea, beetroot, black rice or coconut varieties. And Amanda promises there there will be an Omburger cookbook coming soon. Amanda commutes between Perth and Bali so is very involved in the restaurants, including developing the menu ideas and sourcing new power and super foods. A typical day in Australia has her promoting her ‘Organic Fusion’ cook book, being a mum to her gorgeous 15-year-old daughter who also shares her mum’s love of healthy eating. Making school lunches and school runs. Practicing yoga and teaching yoga and mediation as well as continually working on new ideas for the restaurants. Her time in Bali is a little more laid back. There is morning yoga for herself then onto teaching a daily yoga class, following by breakfast at Buddha Soul, meetings with staff, and recently the design and fit out of the new Omburger Restaurant. She aims to get a sunset walk in before heading back to Buddha Soul at dinnertime. Amanda’s ultimate goal has always been to heal with food, teach people to be truthful and kind to themselves and others, to encourage them to manifest their dreams and keep fit and healthy – and if that includes a little soul searching along the way, even better.